And look at the POCKETS! If you want this, click on the images to visit the listing (this seller has a lot of nice stuff, actually). Good luck! I noticed that seller recently! 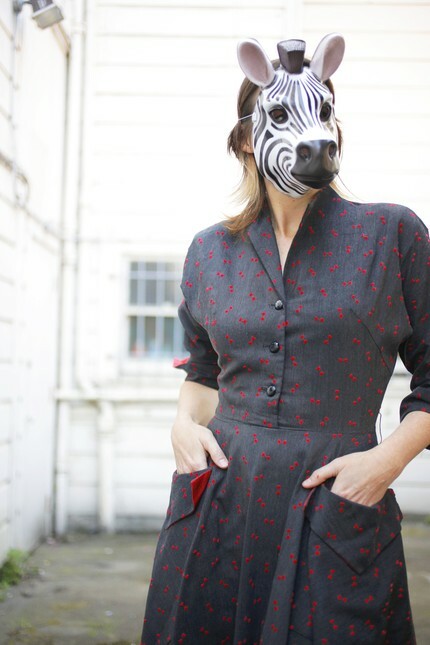 I actually saw that dress and then the price tag so I didn’t click on it – but, wow, the animal masks. I like the fox one best. I like that dress all right, but I WANT A ZEBRA MASK! WAY too expensive. Does anyone know what pattern that is? Expensive?I have to disagree, that is a great price for an awesome vintage dress. (don’t want to start a argument about prices, don’t know the seller, but how cheap should it be? )anyway….The masks are crazy and creepy and awesome all at the same time.So much better then a pouting model. I buy vintage clothing on ebay frequently. $50 max, and I have got some great vintage clothing for less. It would also have been very helpful if the models measurements were given. I know the flat dimensions of the dress were, but I wouldn’t buy based on that. If at least the bust and waist measurements of the model were given it would be helpful.It is a beautiful dress, and the model looks like my size. But I wouldn’t pay any more than $50 for it. Oooh, WANT. A bit out of my price range, but the colors! The pockets! Dang. Oh I want both the dress and the mask ! Wonderful ! I SO would’ve snapped up this dress, but one of your other readers beat me to it. Darg! The mask is so “Breakfast at Tiffany’s”. I love it! I browsed the site and thought the prices were reasonable … especially for Vintage in good/near mint condition. Between this and that Vogue pattern you’ve made so much of recently, I have *got* to find a pattern with this neckline. And soon. That mask is freaking me out. Kinda reminds me of the beginning of Batman, which makes me miss Heath Ledger……..but then there’s that creepy mask. Must go look at her other listings. Erin, I’m sick, too! The CLAMMINESS is the worst. People just aren’t supposed to feel like clams. Blluugggh. This dress crys out for a red belt, red shoes and and a saucey little red hat with just a whisp of veil. Too cute! That’s one sweet dress. Were the little bow shaped red designs flocked? love it! I hope Erin and Cookie both feel better soon.Cookie, did you get your vacumming done? Lovely! 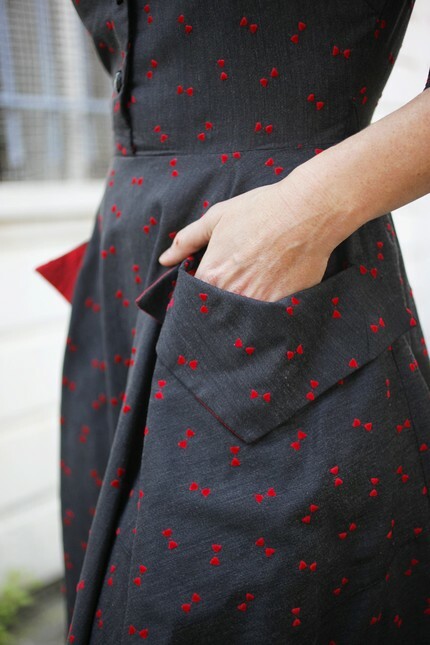 Grey is an underappreciated color, and it’s fabulous with red. OOh, there HAS been a lot of that going around. Sorry you haven’t been feeling well! I actually thought that WAS a dress you had made, Erin, it seemed so YOU. I don’t think the price was out of line, but I’m distressed by a seller of vintage clothing describing the sleeves of a 50s dress as “sloped” rather than “kimono,” and the skirt merely as “full,” rather than “gored” or “full circle,” as appropriate. It tells me that the seller’s knowledge level is not in my comfort range.And I will observe that prices for vintage dresses can vary CONSIDERABLY depending on what part of what country you are shopping for that vintage. It doesn’t make the price the seller is asking WRONG: it means that prices vary considerably. There are costs involved for the seller in finding his/her stock, AND costs involved in the selling of it. If it’s not within your price range, then don’t buy it – but that doesn’t mean there’s an inherent “rightness” to your personal price level. Oh sh!t! I wasn’t at the computer much yesterday. I love the dress and would have snapped it up myself. (It’s a somewhat hard to find size.) As to model’s measurements: It’s possible that the dress is clipped and pinned to fit her. I sell vintage dresses and my mannequin is a size 2/4. I never give Sabrina’s measurements as everything is clipped to fit as if it were her size. I offer a range of sizes. I’m usually surprised when someone says, “Your mannequin is so skinny. Nothing you have fits me.” Okay, now I’m going to spend the rest of the day wishing I had that dress. It’s AWESOME and I love the presentation. Hope you feel better soon, Miss Cookie. And Erin–you, too! We need you here. Ahaha! The zebra mask is just perfect for anonymity. And the dress — I’m sure my wife would love to have one of those. It would match the Jon Renau wigs that she’ll wear next week for the tea party she’s hosting here in the neighborhood. The theme is vintage, of course. She won’t be wearing an animal mask, that’s for sure!